You start feeling overwhelmed and seriously stressed out! But you’ve never been a quitter! And you’ve always been applauded for being such a hard worker! Is your work ethic really worth all the extra anxiety you have in your life? This is where “working smarter” comes in! Working smarter and not harder has different meaning for different people – depending on what their desired outcome is and the resources they have to get there. Perhaps you are working alone and only have yourself to depend on. Or perhaps you have a team of people to work with you, but you need to learn how to properly delegate certain tasks. Whatever situation you are in, there is always a way to produce the same excellent result with less stressful effort! 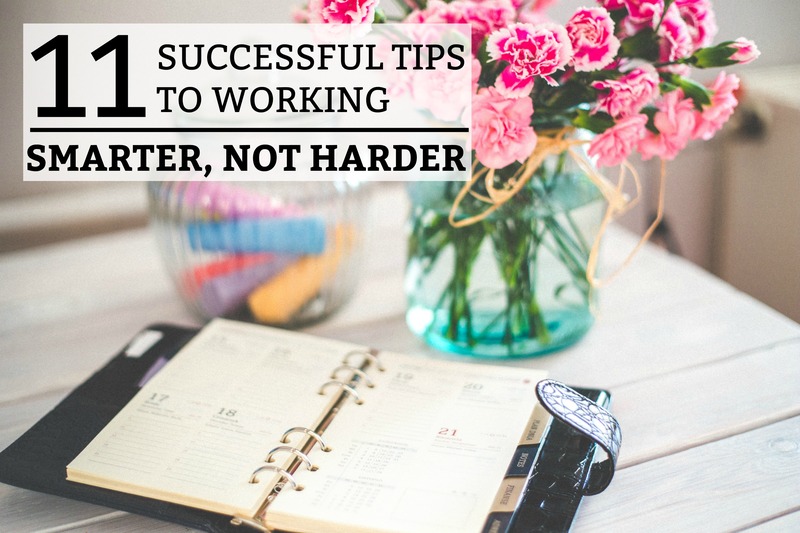 Below are 11 tips on how to work smarter, not harder. Establish an opening ritual to each workday! If you work in an office, maybe make a cup of tea or coffee and greet a few people before sitting down at your desk. Do you work at home? Maybe you can go for a short walk or workout before going to your work-space. If you can identify a pattern of behavior that helps to lift your spirits or calm you, stick with it! At the end of your workday, try to do the same thing. Straighten up your desk. Put sticky-notes on the projects you are working on to remind yourself of where you left off. Back up your computer. Make a list of priorities to complete the following day. Having an opening and closing ritual will help you to create a sense of structure and normalcy. Regardless how hectic your workday may be, at least you can know what to expect at the beginning and ending of each workday. Setting deadlines for major projects helped me so much in my career! Often, the hardest part of completing a project is actually getting started and gaining momentum. When a project looks difficult and huge, it is so easy to procrastinate. Never underestimate your ability to procrastinate – no matter how amazing your work ethic is! If a project is large, always divide it into manageable pieces that you can complete in a certain time frame. This way, you will only have to complete one piece at a time – feeling a sense of accomplishment along the way. There is nothing more disheartening than setting unrealistic expectations for yourself and never completing them the way you expected to. This is the perfect example of working harder, not smarter! By setting deadlines, you are freeing up your time to accomplish other projects that also need attention. This way, you no longer have to feel like you are constantly being interrupted by other tasks that are on your “To-Do” list. In my opinion, when it comes to remembering facts and ideas, actually writing them down on paper is the best option! I am a visual learner (like many of you), so it makes a big difference. Don’t assume that you will be able to remember the instructions your boss gave you or the questions that your team asked. Your brain is a huge filing system that files “non-priority facts” far in the back – where you can’t reach them or remember. By carrying a notebook, you can scribble down these facts to pull out later. You will look far more professional and organized when you don’t have to ask twice – not to mention the time you will save! While working in Human Resources, this tip saved my life! In the beginning, as I was learning the ropes of my job, I didn’t get back with people in a timely manner. I was completely overwhelmed! Rule: Always try to get back with people within 24 hours. This will save you from fretting over frustrated customers or employees, on top of finding the time to answer their question(s)! P.S. Sometimes you’ll violate this rule. I get it – life gets busy! Just remember that it is a small, courteous gesture that will save you a lot of time in the long-run. In most jobs, each day brings new priorities and tasks that need to be accomplished. You must realize that your To-Do list from yesterday has expired and you need to take the time to update it for tomorrow. This doesn’t have to take long, but it does need to be done! Otherwise, you will start the following workday without a realistic expectation of what your priorities are! Trust me, this tip has the potential to save you hours of work and additional stress! Knowing exactly what is expected of you creates a sense of security. And crossing things off a list creates a sense of accomplishment. These two feelings have everything to do with a satisfactory work-day. Do you find it difficult to turn people down or say “No” to someone who constantly asks for favors? When you are an organized and dedicated worker, people often translate that as having the ability to take on a lot more responsibility and work! This is not always the case! Good behavior and an exemplary work ethic should not be punished with far more work than your co-workers. It should be rewarded with extra responsibility or a promotion – with more pay! STOP TAKING ON TASKS THAT ARE NOT YOUR RESPONSIBILITY! No, I am not talking about going the extra mile or helping out a co-worker. I am strictly talking about constantly taking on extra work from someone who is taking advantage of you OR taking on responsibility that you do not have the time or energy to accomplish. Be selective with the tasks that you take on and let others know when your workload capacity is maxed out. Otherwise, you risk Otherwise, you risk suffering from work burnout. Trust yourself and do what you know is best! Learning to decline an offer or a request is a freeing experience! It will help you to see your limits and not to push yourself to the point of exhaustion and anxiety. “No!” One simple word can free up a lot of your time to accomplish the work you were originally assigned. Sticky notes are my best friend! However, you have to find a system that works for you. When you stop a project without completing it, always leave yourself a note! Mark the spot you left off and leave yourself a little memo regarding what you were doing and how you were doing it. This way, you won’t have to accomplish any work twice or waste time trying to figure out the direction you were going. Perhaps you work in a system that allows you to leave electronic notes. Take advantage of the technology and use it! It is always wiser to spend a few more moments writing a short note than to waste a half hour trying to jump back in to where you were before. I have learned that there is nothing more satisfying than an empty inbox. This doesn’t mean that you have read, researched, and answered every single email. It simply means that you have an organized email system that helps you keep on track! Emails that ask questions that haven’t been answered yet have a folder. Instructional emails that are full of valuable information have a folder. I also have several folders with names that are very specific to one topic that I deal with on a daily basis. This way, I have an organized system that I know and trust. All information is easily accessible and emails can be answered in order of importance or date. Everything else either gets deleted or archived! (In a business, everything important should get archived – not deleted). This system allows me to clean out my inbox every day, so I can start new and fresh in the morning! 9.) Stop emailing! Start Talking! Nothing wastes time more than going back and forth over email. When you have a question that needs to be answered quickly, make a quick phone call or host a conference call. A short phone call can save you hours or even days of delay. Chances are, both of you have questions or concerns, so why not address them together – in real-time! Knowledge is power! And knowledge can save you a ton of time – especially when you have the resources and tools to accomplish a project in half the time. However, first you must learn how to use these resources and tools. This will take a great deal of hard work and initiative on your part. You must work to create a mindset that is open to continued learning…even when you are at the top! For me, this involved learning 10 new company software(s), so I could accomplish my workload quickly and effectively. Currently, working in the blogging world, I have had to learn how to use several different programs that have allowed me to automate tasks that would have taken me hours to complete otherwise. Continued learning never stops! And you have to embrace the change and allow yourself to grow and learn. Don’t be a workaholic! Give yourself a break! Yes, you can work yourself into burnout. When you don’t get a project accomplished in time, don’t stress over it! It happens to everyone. If possible, don’t make it a habit to stay late at work. This should only be done for the occasional emergency. Pushing yourself to your limits will only make you more tired – which means more mistakes and less energy to give the next day. You’ll stress yourself out and start to resent your job. Take a break. Use some personal days and try to unwind from all your work-related stress. Most importantly, get adequate sleep! Lack of sleep causes chronic fatigue, headaches, weight gain, confusion, heart problems, and depression. Sleep is essential for a person’s mental and physical well-being. Nothing will make you more productive than to by physically and mentally healthy! Working smart takes practice. But it is absolutely achievable! The most important part is to know your strengths and weaknesses. What stresses you out the most? Do you know what you are really good at? What are you bad at? When you can identify these things, you can start to implement routines that help you to organize, automate, and save time. End goal: work smarter, not harder! These were really awesome tips i cant wait to try them ! Thanks for sharing.